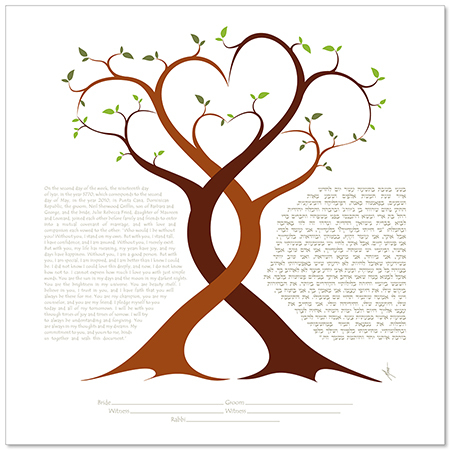 ketubah4less : 11" x 12"
Standard : 15.5" x 17"
You and I, my love, gently wrapped in each other's arms, celebrating our sweet passion as nature's glory dances around us. I do not know how I could love you more than I do today. I am yours, in your loving embrace. A Lover's Embrace gave me the opportunity to combine my love of modern whimsicality with my passion for nature. When time allows, I love a good hike in the woods and greatly enjoy the intertwining sculpture of trees. 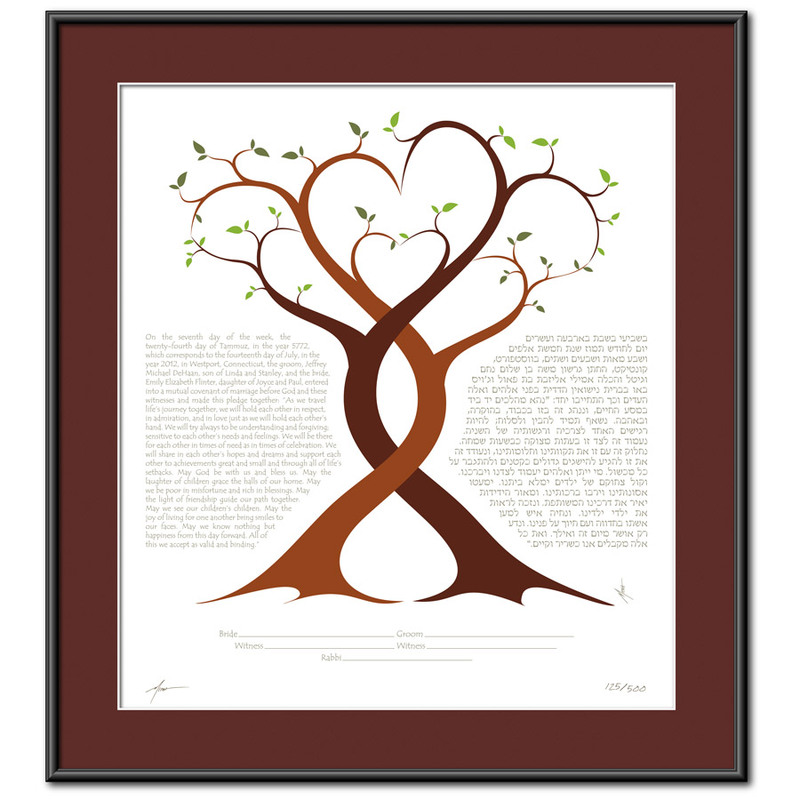 I was fascinated on a recent hike to see a tree with branches that formed two loose hearts at the top, and as an artist that creates ketubot, I was struck by the intertwining symbolism of the tree of life and love, and couldn't wait to get back to my studio to bring the design to life. 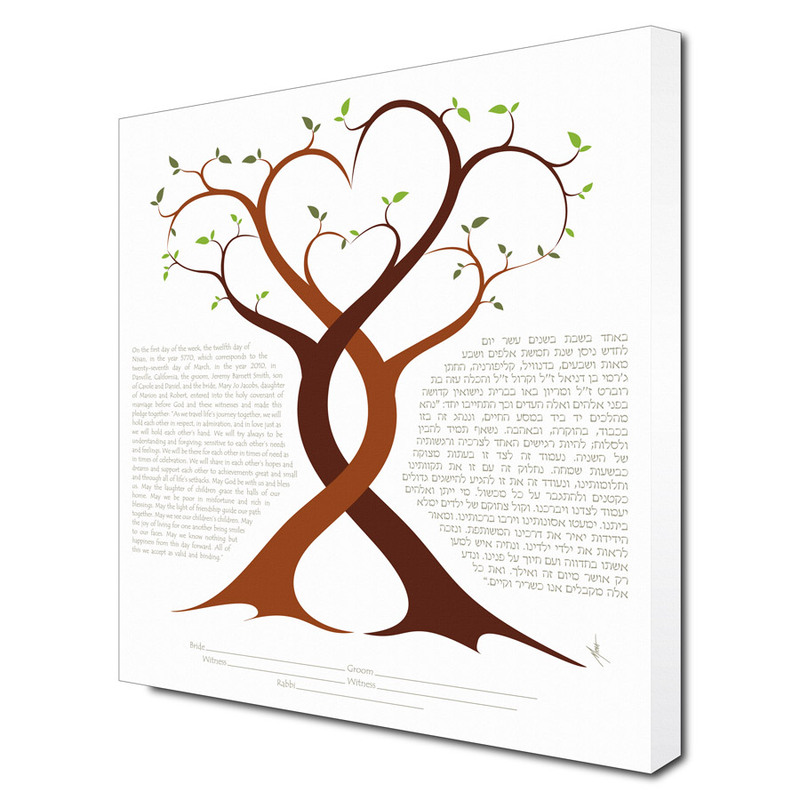 In just a short period of time, Micah Parker has become recognized as a leading ketubah artist with fresh, stunning designs that are unlike any others on the market. His modern interpretation of this traditional art form is being welcomed by today's generation of brides and grooms around the world. One of his ketubah designs, Renaissance, is featured in the Associated American Jewish Museum's traveling exhibition of ketubot, and his work was chosen by a national search firm to be featured on the front cover of a 5760 Hebrew calendar. His artwork has also been featured in several publications and on television during TLC’s A Wedding Story.